I bought this vintage side table made by the Mersman company at a thriftstore. I refurbished it with new paint to polish it up a bit and to give it a new look. I would like to know how much it would be worth by today's standards. The value may be whatever you'd pay for it at Ashley or similar furniture store. It's still a "used" table. While it's a beautiful table, it's not restored. It's been painted. Go to eBay, punch in Mersman furniture for values of original-finish tables. When I got married in 1967, we purchased Mersman end tables and coffee table. These are top of the line tables. 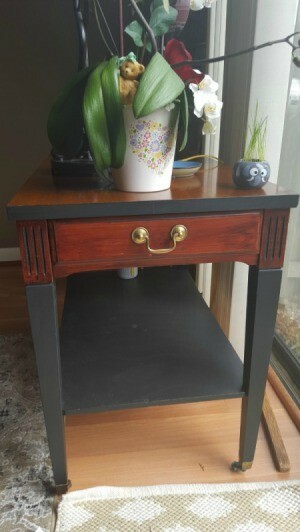 Mine had a drawer in each end table and the joints were dovetailed. I hope you are enjoying your table. Dont let anyone make you feel badly about it. I gave my away because they were too big for my little house. I think my daughter has them. As with everything, Manuela, it's worth exactly what a potential buyer is willing to pay. If you really want to know, list it on e-bay or craigslist and see if anyone's interested. The words you use to describe the item will either compel people to buy or repel them: it's up to you. "Gently used Mersman," for instance, will certainly be more appealing than saying "used furniture." You can find prices on EBay, Craig's List, online searches, antique dealers, etc. Most buyers prefer the original finish on furniture and no refinishing, paint etc., of any type. As you have painted the table, the value is much reduced.